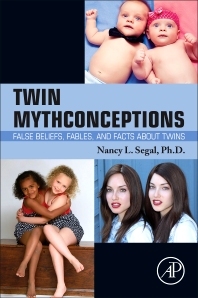 Twin Mythconceptions: False Beliefs, Fables, and Facts about Twins sheds new light on over 70 commonly held ideas and beliefs about the origins and development of identical and fraternal twins. Using the latest scientific findings from psychology, psychiatry, biology, and education, the book separates fact from fiction. Each idea about twins is described, followed by both a short answer about the truth, and then a longer, more detailed explanation. Coverage includes embryology of twins, twin types, intellectual growth, personality traits, sexual orientation of twins, marital relationships, epigenetic analyses, and more. Five appendices cover selected topics in greater depth, such as the frequency of different twin types and the varieties of polar body twin pairs. This book will inform and entertain behavioral and life science researchers, health professionals, twins, parents of twins, and anyone interested in the fascinating topic of twins. Appendix 1: What About Hellin’s Law? And Does Weinberg Rule? Appendix 2: Right-Handed or Left-Handed? Dr. Nancy L. Segal received a B.A. degree in psychology and literature from Boston University (1973), and M.A. (1974) and Ph.D. (1982) degrees in the Social Sciences and Behavioral Sciences from the University of Chicago. She is currently Professor of Psychology at California State University, Fullerton and Director of the Twin Studies Center. She has authored over 200 scientific articles and book chapters, as well as several books on twins. Dr. Segal has received several international awards, including the James Shields Award for Lifetime Contributions to Twin Research (International Society for Twin Studies) and the International Making a Difference Award (Multiple Births Canada). She is also the 2016 recipient of the Wang Family Excellence Award from California State University. Dr. Segal has contributed to national and international media, including the New York Times and the Washington Post. She has been a frequent guest on national and international television and radio programs, such as the Today Show, Good Morning America, the Martha Stewart Show, the Oprah Winfrey Show and The Forum (BBC).